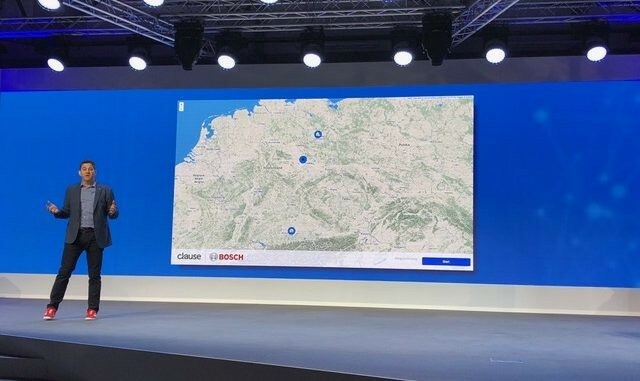 This morning in Berlin, Germany, legal tech pioneer, Clause, successfully demonstrated a ‘live smart legal contract’ using IoT data, to 3,500 participants at the Bosch Connected World, which handled logistics payments for a group of transport vehicles in real time as the audience watched. 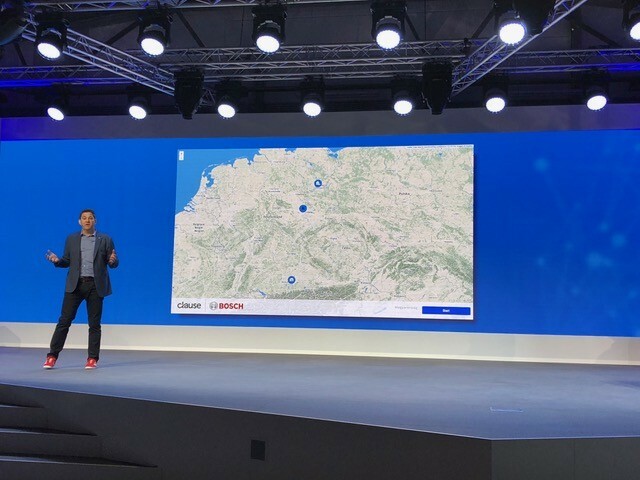 Clause told Artificial Lawyer how the demonstration by CTO, Dan Selman, (pictured above) and team, involved a smart logistics ‘platoon’ contract that was pulling in IoT data from the Bosch IoT Cloud related to a group of transport vehicles. Payments were then made based on this data, which was executed via a smart contract. The system is based on the ‘platoon’ transport concept where different trucks take it in turns to drive at the front of a mini-convoy on the autobahn or motorway. Because of aerodynamics of the platoon configuration, the trucks can save money on fuel consumption. The lead vehicle, which gets the brunt of the air resistance, expends more fuel than the others, and hence spends more money making its delivery, although it also reduces its normal fuel consumption because of the collective shape of the ‘platoon’ on the road. The lead vehicle also ‘assumes more responsibilities and so should be paid more’ Selman pointed out. To manage the process and to make it more fair, contracts can be used to balance out the savings using payments between the different trucks (and their trucking companies). One could say it is a way of reaching an optimum financial solution to a collective transport problem. ‘Bosch wanted to show a new business model and we were happy to show that smart legal contracts can not only improve existing processes, but redefine and introduce new business models that were previously impossible or prohibitively complex to implement,’ he said. Clause added that the legal smart contract calculated the payments between trucks as they dynamically lead, joined, and left the platoon according to the terms of the contract. Dan Selman, CTO, Clause, in Berlin giving the live presentation of the tech. The Clause tooling platform also generated invoices for all platoon parties according to the terms, in real-time. ‘To our knowledge, it’s the first live IoT smart legal contract deployed and demonstrated in public,’ Hunn told Artificial Lawyer. ‘This wouldn’t be possible before. You would have to deal with reconciling and netting payments between trucks from various organisations manually. As such, an organisation would have had to have done this and it is not clear who that would be. That also introduces trust issues. Here, the contract does all of that automatically, in real-time,’ he concluded. The contract runs on the open source Accord Project protocol, its initial technology which was open-sourced earlier this year by Clause. 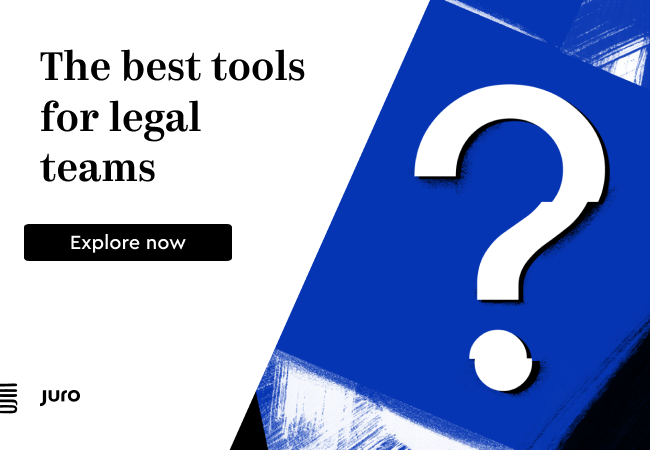 The protocol is designed to become the standard for smart legal contracting and counts IACCM, Open Identity Exchange, Trusted IoT Alliance and many other industry leading organisations as collaborators and partners. 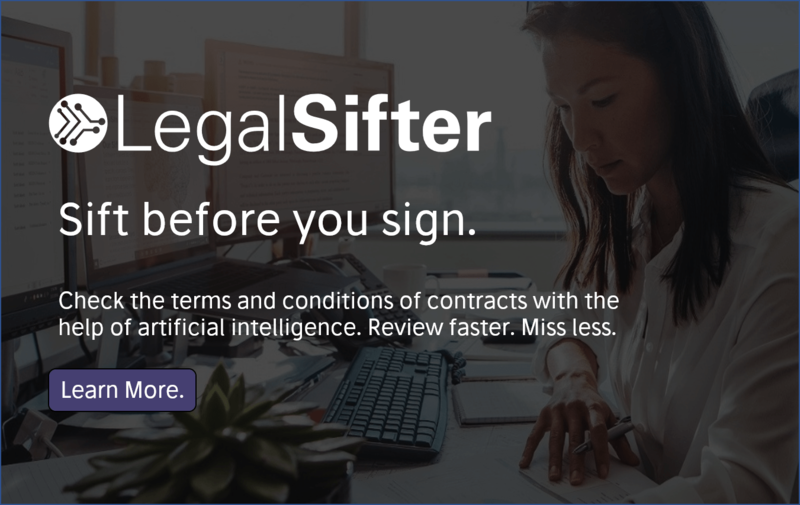 On Tuesday, IEEE announced a partnership with the Accord Project for techno-legal smart legal contract standards. The Accord Project protocol is DLT-agnostic meaning that it can run as ‘a middleware layer’ on top of any distributed ledger platform. A primer to the open source technology is available here.